Compared to the red-orange-yellow part of the color spectrum, green offers pretty slim pickings in the name department, which is surprising when you consider the abundance of greens in nature. If it’s true that there are so many Latin names for shades of red because the Romans had many ways to make red dyes, then the answer may be that there weren’t many ways to make greens. 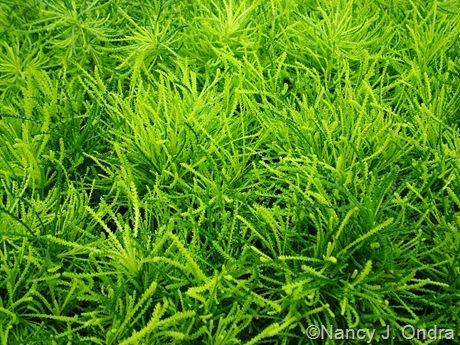 In the plant world, names that indicate green coloration aren’t all that useful anyway, since it’s so common, unless it’s referring to something that’s normally not green, such as a flower. 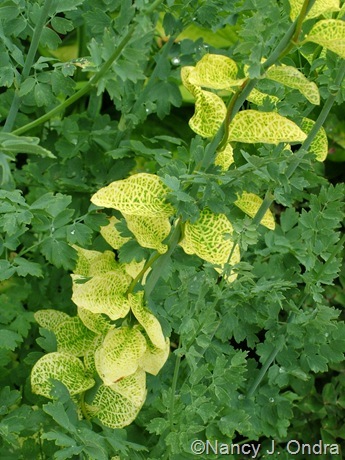 In botanical names, green appears mostly as virens (think of the green-leaved lavender cotton [Santolina virens]) or as viride or viridis (as in Helleborus viridis, one of the green-flowered hellebores, or the green-flowered form of love-lies-bleeding, Amaranthus caudatus ‘Viridis’). 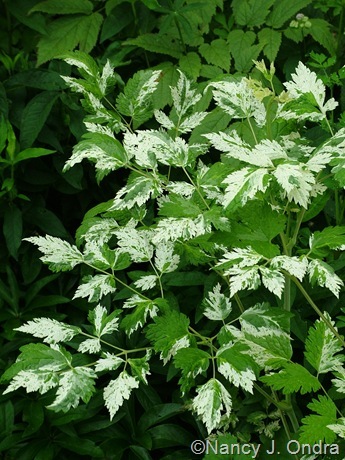 Virescens or viridescens refers to becoming or tending toward green, as in the bizarrely cool green-flowered wood anemone (Anemone nemorosa ‘Virescens’). It’s easy to remember that the prefix “chlor-” (as in chlorophyll) also refers to green. 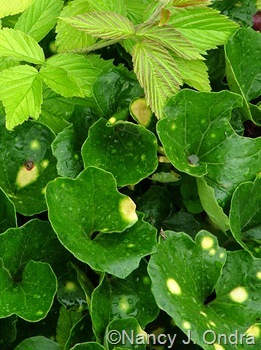 Logic would dictate that Trillium chloropetalum, the most obvious example, has green petals, and sometimes it does. But sometimes it doesn’t, which is a good reminder that all this nomenclature stuff isn’t infallible. There’s also euchlorus (-a, -um), translated to “good green”; for example, Tilia x euchlora (Crimean linden), with rich green, glossy foliage. And for blue-green, there’s aerugineus (-a, -um), as in Linaria aeruginea, with blue-green foliage, and aeruginosus (-a, -um), as in Rhododendron campanulatum subsp. aeruginosum. 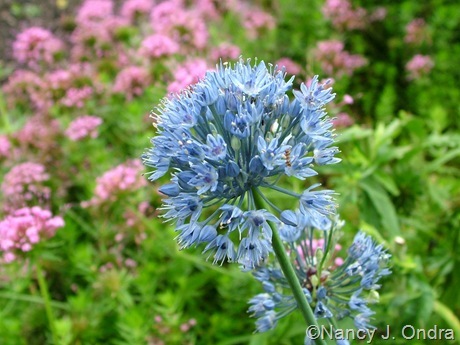 Blues, too, are pretty sparse when it comes to plant names. 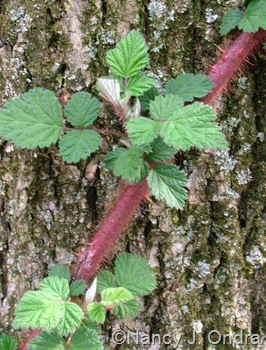 They appear mostly in relation to flower and berry colors; “blue” leaves are usually described with gray-related terms. 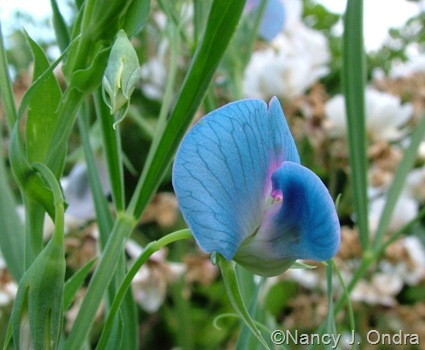 For deep blues, there’s azureus (-a, -um): think of Lathyrus sativus var. 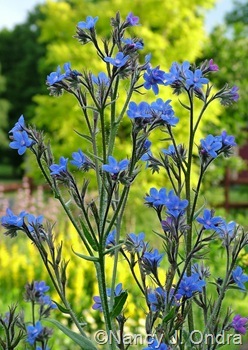 azureus (chickling or grass pea) and Anchusa azurea (Italian bugloss). Sky blue is covered by caeruleus/coeruleus (-a, -um) and caerulescens, as in Passiflora caerulea (blue passionflower) and Allium caeruleum (blue allium). Coelestis and coelestinus (-a, -um) also fall here: e.g., Commelina tuberosa Coelestis Group (dayflower). For a gray-blue, there’s caesius (-a, -um), as in Solidago caesia (wreath goldenrod), which has a pale bluish to grayish bloom on its stems. Hyacinthinus (-a, -um) should indicate an intense purple-blue, though the best known example – Hosta ‘Fortunei Hyacinthina’ – has rather washy, light purple flowers. One more set of blue terms, based on cyan, the Greek word for blue, includes cyaneus (-a, -um) and the prefix “cyan-”, as in Cuphea cyanea (black-eyed cuphea, with rich blue anthers) and Centaurea cyanea (bachelor’s buttons). 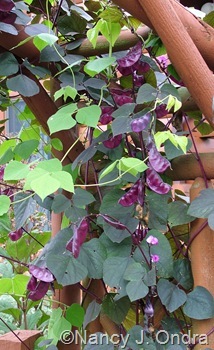 Various purples complete the rainbow of colors for flowers, foliage, and fruits. 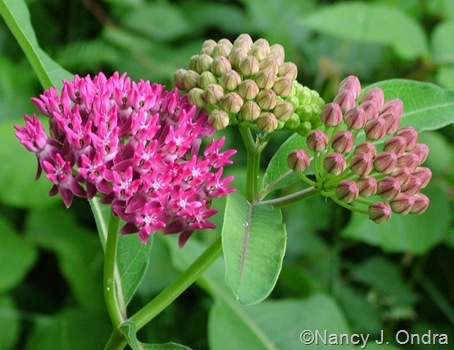 Purpureus (-a, -um) and purpuratus (-a, -um) are easy to remember: think of Echinacea purpurea (purple coneflower, which is actually pink) and Lablab purpureus (hyacinth bean). 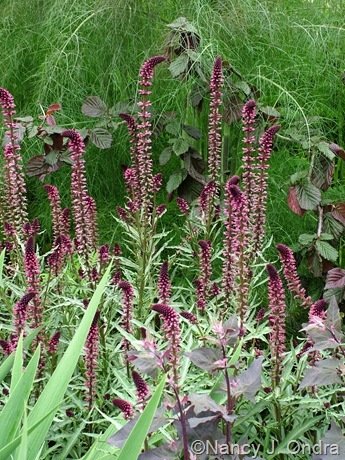 For deep purple, there’s atropurpureus (-a, -um): e.g., Lysimachia atropurpurea and Solanum atropurpureum. And for “being or becoming purple,” there’s purpurascens, as in Salvia officinalis ‘Purpurascens’ (purple sage) and Asclepias purpurascens (purple milkweed). For lilac-purple, there’s lilacinus (-a, -um): for example, Hydrangea macrophylla ‘Mariesii Lilacina’ and Echeveria lilacina. No bonus points for guessing that amethystinus (-a, -um) indicates various shades of purple; e.g., Festuca amethystina (with purplish flower stalks). Violaceus (-a, -um) is another easy one to guess. Well, you’d think it means violet; in reality, it seems to be pretty much any purple. Clematis ‘Venosa Violacea’, for instance, has white-marked violet flowers, but Tulbaghia violacea (society garlic) has purplish pink flowers. Phoeniceus (-a, -um), phoenico-, and puniceus (-a, -um) usually refer to a reddish purple: think of Verbascum phoeniceum (purple mullein), Rubus phoenicolasius (wineberry, a bramble with reddish purple hairs on the stems), and Symphyotrichum puniceum (purple-stemmed aster). And finally, there are a bunch of terms that relate to coloration, rather than specific colors. Tinctus (-a, -um) is a general term for tinged or colored. Knowing that and a few other color terms, you could guess that Crocus chrysanthus var. fuscotinctus is a crocus with golden (chrysanthus) flowers that are tinged (-tinctus) with brown (fusco-) streaks. It would would be easy to confuse tincta with tinctoria, but the latter has a different meaning: used for dyeing, as in Isatis tinctoria (dyer’s woad), which creates a blue dye, and Anthemis tinctoria (golden marguerite), which produces a rich yellow dye. To indicate that leaves, petals, or other structures are one (or the same) color, there’s concolor, as in Abies concolor (white fir), with needles that are the same color on both sides. 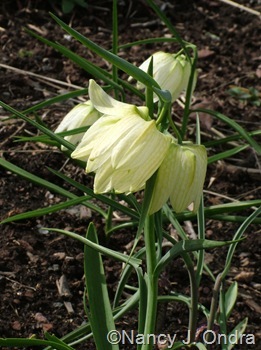 It’s easy to guess that unicolor, too, means “one color,” as in Fritillaria meleagris var. unicolor subvar. alba: a really long name for the checkered lily with plain white flowers instead of the usual dark-and-light patterned petals. 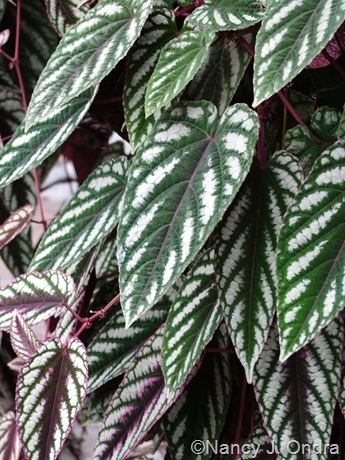 For structures that have different colors, there’s discolor: rex begonia vine (Cissus discolor), for instance, has silver and green and sometimes maroon, too, in its leaves. And bicolor, obviously, means “of two colors,” as in Caladium bicolor, which usually has at least two different colors in its boldly marked leaves. 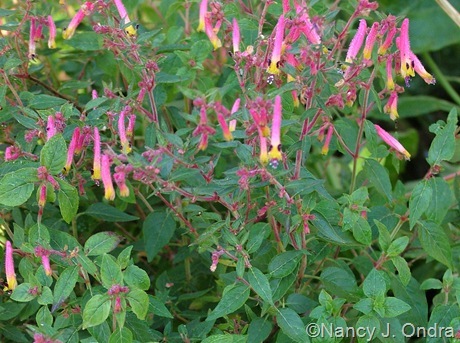 Changing colors are indicated by versicolor (e.g., Epimedium x versicolor) and mutabilis (as in Rosa x odorata ‘Mutabilis’, as well as Nicotiana mutabilis, which ages from white to rich pink). 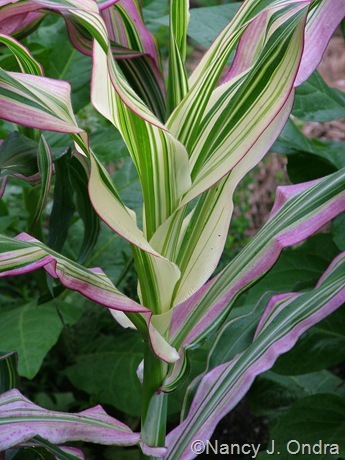 When basic color markings are involved, there’s variegatus (-a, -um), meaning variegated, of course, as in Actaea simplex ‘Variegata’ (variegated bugbane), and pictus (-a, -um), meaning painted: e.g., Phalaris variegata var. 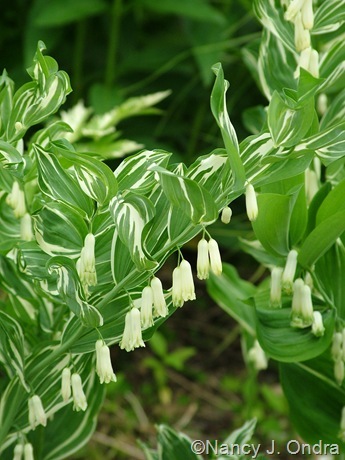 picta (variegated ribbon grass). 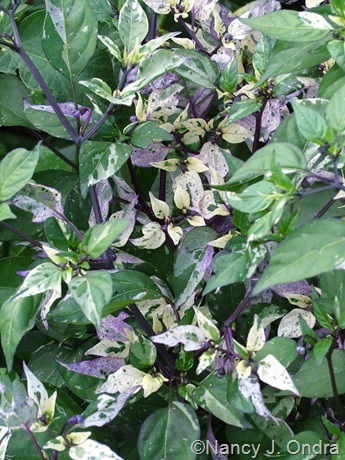 Marmoratus (-a, -um) refers to mottling, as in the mottled leaves of Arum italicum subsp. italicum ‘Marmoratum’ (Italian arum). 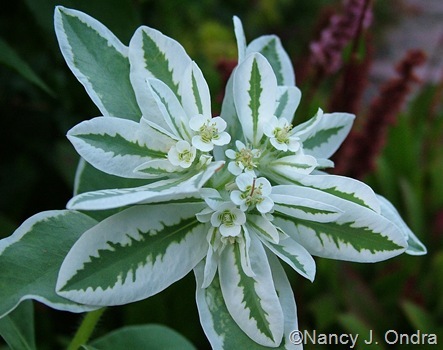 Marginatus (-a, -um), obviously, refers to color markings along the leaf margins, as in Euphorbia marginata (snow-on-the-mountain). And last, if you can remember that a reticule is a netted purse, or that a retiarius is a gladiator who fought with a net, then there’s no trouble to make the connection between reticulatus (-a, -um) and netted markings, as in Lonicera japonica ‘Aureoreticulata’ (goldnet honeysuckle). Easy, right? Sorry for going on so long. Maybe I should have broken it into short daily posts! I don’t know if I would go so far as to say it was easy. I can tell you that the next time I am walking through a nursery reading those tags trying to see if I have them already and I see some of those key suffixes I will be thinking of this post. I will wish that I had all of this information in my head instead of in my computer. I guess that was a poor joke, huh? It’s anything *but* easy, unless you use this stuff frequently. I think I’ve already forgotten a good bit of it myself! Love to pay you visits, Nan! Have a great weekend. My brain is tired too! Thanks for reading through, anyway. 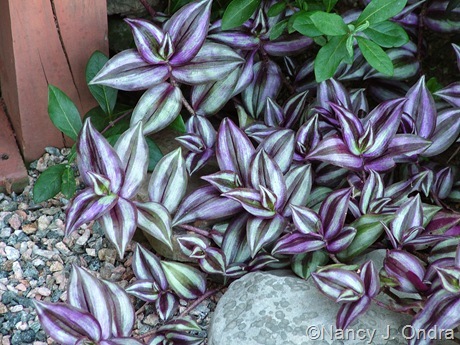 I treat the tradescantia as an annual. It’s perfect for one shady spot out front, but I don’t have luck overwintering it indoors; I guess I keep my house too cold for it. This post is basically a web implementation of what has your wonderful book “Foliage,” which the studio every time I have to design a garden for the different combinations of foliage, a Bible for me in short! Nan great, as always. Thank you for your valuable contributions to our knowledge. Thank you so much, Tiziana. The fact that the book and this post are useful to you in Sardinia is so gratifying. 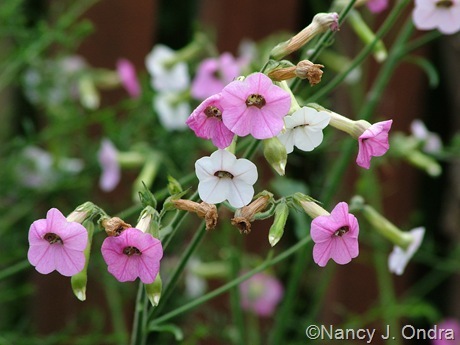 On many levels, we gardeners speak a universal language. A wonderful post with great illustrations. I will be reading all three parts over and over through the winter. — it would make a wonderful little book! Funny you should mention that, Marie…it just might! Um, not movies, no. “Reticularius” does come up a few times in a series of historical novels I’m crazy about, though. I had to look it up at first, then finally made the “net” connection. I agree about the part about a wonderful little book this could make, especially with your beautiful photographs accompanying the descriptions! I’d definitely buy a copy! Thank you so much, Megan! You may have that opportunity soon. Thank you very much for visiting my blog, what a surprise actually, I did not expect this ! I have been recommended to read your book on Grasses as one of the best ones on the subjet. I was deligthed by the great pictures in the book and how you speak about grasses, teaching how to associate them with perennials and shrubs. I really enjoyed reading it ! Hello, Carzan! Thanks for returning the visit. I enjoyed looking at the beautiful photos on your blog, and I’m pleased to have made a new blogging friend. I agree totally, Jean – the sound of many of these names is as delightful as knowing their meaning. Nan – You have provided me with such an education. I have talked about Latin in the garden in my weekly column – but you have shown me a whole new way of expanding on that – with examples. And ideas for new plants for my garden. I hope your readers will visit me for my giveaway – Right Rose Right Place by Peter Scheider and CowPots. And I also thank you for the garden bloggers idea gallery. I have already made some additions. You’re really having fun with the giveaways this month, Pat! I hope you get lots of responses for your celebration. I’m glad you’ve found this post and the Idea Gallery useful too. Thanks! I must look for the green love lies bleeding. Unique,but hey, most of them are. It is kind of odd-looking in that sort of yellow-green color (the camera didn’t capture it very well in this image), but you’re right, it’s unique. I think I like the velvety pinkish red of the species better, though.